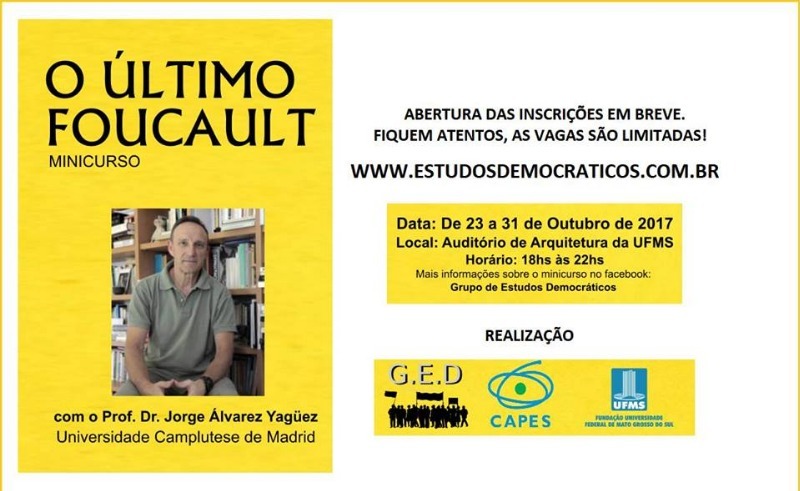 Intensive course on the theme: THE LAST FOUCAULT "
Lectured by Professor Jorge Álvarez Yaguez (Prof. Professor of the Complutense University of Madrid) and author of several works on the subject, among which stand out The last Foucault. Will of truth and subjectivity (Biblioteca Nueva, Madrid, 2013); Politics and Republic. Aristotle and Machiavelli, Madrid, New Library, 2012; Individual, freedom and community, A Coruña, Ludus, 2000, among several other books, editions and articles. Content and perspective: The course aims to analyze Foucault's essay in its last period, in its last seven years, from 1977 to 1984. This period includes the books published by the author, which include part of his History of Sexuality; but also include eight courses at the Collège de France, published posthumously, as well as various conferences and seminars. In this course, it is a question of understanding the problems addressed during this time, and situating it in relation to the whole of his work, seeing what new theoretical contributions are and how these new contributions suppose an effective change from the previous moment . The three categories around which it is proposed to do this interpretation are Truth, Power and Subjectivity. The course will be held in seven sessions, distributed over two weeks. Dates for the mini-course: from 23 to 31 October 2017.
history, social sciences, law, psychology, among others. - Course open to internal and external students to UFMS. - Course open to the general community. - Course limited to 100 students. Participation and frequency rules will be stipulated (for example, compliance with the opening hours of sessions, loss of the right to register in case of 2 absences, among others). 1st session: What is meant by "the last Foucault"? Controversial interpretations of this content. The place of the last stage in the whole of the work. The foucaultian yarn. foucauldian Inflections in your thinking. 3rd session: Government of self and government of others in the Courses of the Collège de France. 4th session: The problems of the Collège de France courses. The question of power: Sovereignty, disciplines and biopolitics. The concept of governmentality. 5th session: The course on neoliberalism. Session 6: The question of parresia. Focus on the question of Truth. Democracy and parresia. 7th session: Parresia in the Greco-Roman world, in Christianity. Traits in modernity and the contemporary world. Course organized by the Group of Democratic Studies (coordination of Marta Nunes da Costa). Information about the bibliography will be given by email. Entries accepted until October 23, 2017.